It’s happened. It’s finally happened. In a move that has hipsters donning their good flannel and breaking out that case of Genesee they were saving for a special occasion, the rotary cell phone is now a reality. [Jaromir] created this astonishingly retro future device as an entry for the NXP LPC810 challenge, a contest to do the most with an ARM Cortex M0+ microcontroller in an 8-pin package. Having only six I/O pins for controlling a GSM module, display a few buttons, and the fancy rotary dial meant [Jaromir] needed to expand his I/O some way. He chose a shift register to handle the buttons and display in a somewhat impressive demonstration of using a shift register as both an input and output expander at the same time. From the videos [Jaromir] uploaded, the rotary cell phone isn’t ready for Think Geek to do a production run quite yet. He needs to enter the PIN for the SIM card, AT commands for the GSM module, and is, of course, a horrible method of user input for the younglings who have only seen rotary phones in old movies. That being said, it’s a rotary cell phone running on an 8-pin microcontroller. What more do you want? 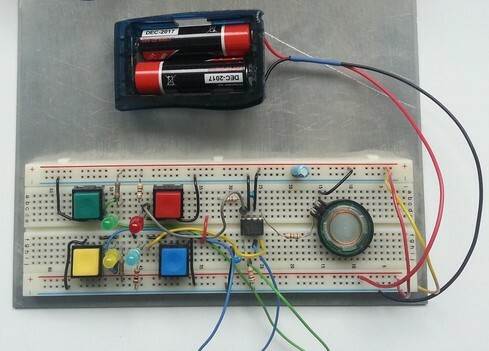 This breadboard version of a Simon Says game is a great way to try your skills on a new microcontroller platform. The eight-pin chip seen in the center of the board is an LPC810 microcontroller which [Hartmut Wendt] is just getting started with. It’s a rare example of a low-pin count DIP package for an ARM device (Cortext M0). The breadboard friendly footprint makes it easy to work with, but you could pull off the same build with a dev board like one of the STM discovery offerings or the Stellaris Launchpad boards. Why is this a good way to learn? It involves input, output, and generating waveforms which we’d assume means timers (we didn’t dig through the source code which is available form the page linked above). Each colored button has a matching LED which blinks out the pattern which you must replicate to keep the game going; you know how Simon Says works, right?. At the same time a different pitch is played by the speaker on the right. Another good exercise would be to take [Hartmut’s] code and port it for a different chip, be it ARM or otherwise.